In this paper, we review research in the emerging practice and research field of Human Work Interaction Design (HWID). We present a HWID framework, and a sample of 54 HWID related papers from workshops, conferences and journals from the period 2009–2014. We group the papers into six topical groups, and then attempt to map these groups to the framework to find research gaps for future research. We find that the groups of papers cover all areas of the framework well for a variety of work and leisure domains. The area in strongest need for more research papers is the development of the holistic framework itself. Furthermore, much focus has been on studying design sketching or implemented systems-in-use, while little attention has been paid to mature design (prototypes) or early implementation (content templates). In conclusion, we recommend an update to the framework so that it can be also useful for research in prototyping and early organizational implementation. 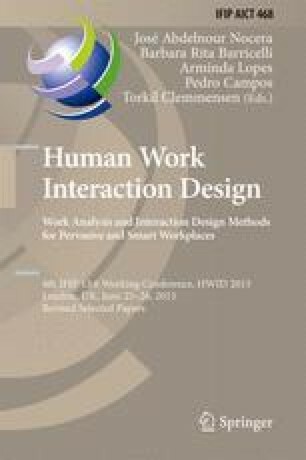 Abdelnour-Nocera, J., Barricelli, B., Clemmensen, T., (2013) ICT Design and evaluation for trans-mediated workplaces: towards a common framework in human work interaction design. Workshop at INTERACT 2013, Cape Town, South Africa. Bobeth, J., Gattol, V., Meyer, I., Müller, S., Soldatos, J., Egger, S., Busch, M., Tscheligli, M., (2014). Platform for Ergonomic and Motivating ICT-based Age-Friendly Workplaces. Workshop HWID, NordiCHI, Helsinki, Finland. Burns, C. (2012) Cognitive Work Analysis: New Dimensions. Working Conference HWID, Copenhagen, Denmark. HWID 2012, IFIP AICT 407, pp. 1–11, 2013. Campos, P., Noronha, H. (2012) On the Usage of Different Work Analysis Methods for Collaborative Review of Large Scale 3D CAD Models. Working Conference HWID, Copenhagen, Denmark. HWID 2012, IFIP AICT 407, pp. 12–21, 2013. Clemmensen, T., Barlow, S. (2013) Identifying user experience goals for interactive climate management business systems. Workshop at INTERACT 2013, Cape Town, South Africa. Gonçalves, F., Campos, P. (2014) Towards Pervasive and Inspiring Workplaces for Creative Writers: Simple Interactions for a Complex Domain. Workshop HWID, NordiCHI, Helsinki, Finland. Guribye, F., Nyre, L., Torvund, E. (2014) Viz Reporter in vivo – Design Implications for Mobile Journalism Beyond the Professional Newsroom. Workshop HWID, NordiCHI, Helsinki, Finland. Law, E., Abdelnour-Nocera, J., (2014) Towards a sociotechnical understanding of smart and pervasive technologies used by high-managed and low-managed teleworkers, NordiCHI, Helsinki, Finland. Lind, T., Cajander, Å., (2013) Mind the Gap -Towards a Framework for Analysing the Deployment of IT Systems from a Sociotechnical Perspective. Workshop at INTERACT 2013, Cape Town, South Africa. Meerbeek, B., Loenen, E. (2014). Understanding User Experience of Smart Workplaces: mixed methods. Workshop HWID, NordiCHI, Helsinki, Finland. Murer, M., Tscheligi, M., Fuchsberger, V., (2014) Staged Inquiries: Studying Contextual Interaction through Industrial Showcasing. Workshop HWID, NordiCHI, Helsinki, Finland. Sandblad, B., (2013) Using a vision seminar process to evaluate the work environment of future work. Workshop at INTERACT 2013, Cape Town, South Africa. Yadav, M., Clemmensen, T., (2014) Multiple Data Stream measurement of UX in a work context. Workshop HWID NordiCHI, Helsinki, Finland. Bhutkar, G., Katre, D., Ray, G., Deshmukh, S., (2012), Usability Model for Medical User Interface of Ventilator System in Intensive Care Unit. Working Conference HWID, Copenhagen, Denmark. HWID 2012, IFIP AICT 407, pp. 46–64, 2013. Clemmensen, T., Hertzum, M., Yang, J., Chen, Y., (2013). Do Usability Professionals Think about User Experience in the Same Way as Users and Developers Do? Workshop at INTERACT 2013 Cape Town, South Africa. Chino, T., Torri, K., Uchihira, N., Hirabayashi, Y. (2012) Work and Speech Interactions among Staff at an Elderly Care Facility. Third IFIP WG 13.6 Working Conference, HWID, Copenhagen, Denmark. Katre, D., Bhutkar, G., Karmarkar, S., (2009) Usability Heuristics and Quality Indicators for the Usability Evaluation of Touch Screen Ventilator Systems. HWID 2009, IFIP AICT 316, pp. 83–97, 2010. Scandurra, I., Åhlfeldt, R., Persson, A., Hägglund, M., (2013) Challenges in Applying a Participatory Approach in a Nation-wide Project-The Case of ‘Usability of Swedish eHealth Systems 2013’. Workshop at INTERACT 2013, Cape Town, South Africa. Serra, J., Leitão, J., Alves, P., Lopes, A., (2014) How to Improve the Interaction Quality of Psychologists and Patients: a Mediated Interface. NordiCHI, Helsinki, Finland. Silvestre, R., Anacleto, J., Fels, S. (2013). Designing a Health-care Worker-Centred System for a Chronic Mental Care Hospital. Workshop at INTERACT 2013, Cape Town, South Africa. Sonderegger, A., Lalanne, D., Bergholoz, L., Ringeval, F., Sauer, J. (2013) Computer-supported work in partially distributed and co-located teams: the influence of mood feedback, at the INTERACT Cape Town, South Africa. Valtonen, T., Kalakoski, V., Paajanen, T., (2014). Using Well-being Data to Support Work Design, Workshop HWID NordiCHI, Helsinki, Finland. Clemmensen, T. (2009) A Comparison of What is Part of Usability Testing in Three Countries. Working Paper NR. 04-2009, Copenhagen Business School, Handelshøjskolen. Chino, T., Torri, K., Uchihira, N., Hirabayashi, Y. (2013). Supporting Human Collaborative Works by Monitoring Everyday Conversations. Workshop at INTERACT 2013, Cape Town, South Africa. Haines, J., Olson, J., Olson, G. (2013) Here or There? : How Configuration of Transnational Teams Impacts Social Capital, at the INTERACT Cape Town, South Africa. Jansson, A., Erlandsson, M., Fröjd, C., Arvidsson, M., (2013) Collegial Collaboration for Safety: Assessing Situation Awareness by Exploring Cognitive Strategies. Workshop at INTERACT 2013, Cape Town, South Africa. Li, J., Robertson, T., Müller-Tomfelde, C., (2012). Distributed Scientific Group Collaboration across Biocontainment Barriers. CSCW’12, Seattle, Washington, USA. Müller-Tomfelde, C., Li, J., Hyatt, A. (2011) An Integrated Communication and Collaboration Platform for distributed Scientific Workgroups. INTERACT 2011, Lisbon, Portugal. Camara, S. Oyugi, C., Abdelnour-Nocera, J., Smith, A., (2009). Augmenting Usability: Cultural Elicitation in HCI. HWID 2009, IFIP AICT 316, pp. 46–56. 2010. Campos, P. (2011) Designing Accessible Public Information Systems – An Interactive Tourism Office. International Journal of Public Information Systems, vol. 2011:3. Clemmensen, T. (2011) A Human Work Interaction Design (HWID) Case Study in E-Government and Public Information Systems. IFIP INTERACT 2011 Workshop on Human Work Interaction Design for e-Government and Public Information Systems, Lisbon, Portugal. Clemmensen, T., Yammiyavar, P., Orngreen, R., Katre, D. (2009). Usability in a Cultural Context: A report on the Scope, Process and Research Results of CultUsab – The Cultural Usability Project. HWID 2009, IFIP AICT 316, pp. 3–20, 2010. Clemmensen, T., Roese, K., (2009) An Overview of a Decade of Journal Publications about Culture and Human-Computer Interaction (HCI). Working Paper NR. 03-2009, Copenhagen Business School, Handelshøjskolen. Deshpande, Y., Yammiyavar, P., Bhattacharya, S., (2012) ‘Adaptation’ in Children – A GUI Interaction Based Task-Performance Study. Third IFIP WG 13.6 Working Conference, HWID, Copenhagen, Denmark. Hamilton, F., Pavan, P., McHale, K., (2011) Designing usable E-Government services for the citizen – Success within user centred design. International Journal of Public Information Systems, vol. 2011:3. Katre, D., Gupta, M., (2011) Usability Evaluation of 28 State Government Portals of India. IFIP INTERACT 2011 Workshop on Human Work Interaction Design for e-Government and Public Information Systems, Lisbon, Portugal. Kurosu, M. (2009) Usability and Culture as Two of the Value Criteria for Evaluating the Artifact: A New Perspective from the Artifact Development Analysis (ADA). HWID 2009, IFIP AICT 316, pp. 67–75, 2010. Righi, V., Sayago, S., Blat, J. (2011) Towards understanding E-Government with older people and designing an inclusive platform with them – A preliminary results of a rapid ethnographical study. International Journal of Public Information Systems, vol. 2011:3. Schreder, G., Siebenhandl, K., Mayr, E., Smuc, M., Nagl, M., (2011) Narrative Interaction as Means for intuitive public information systems. International Journal of Public Information Systems, vol. 2011:3. Wiles, A., Roberts, S., Abdelnour-Nocera, J. (2012) Library Usability in Higher Education: How User Experience can Form Library Policy. Third IFIP WG 13.6 Working Conference, HWID, Copenhagen, Denmark. Yammiyavar, P. (2009) Status of HCI and Usability Research in Indian Educational Institutions. HWID 2009, IFIP AICT 316, pp. 21–27, 2010. Dai, Z., Paasch, K. (2012) A Game-Like Interactive Questionnaire for PV Application Research by Participatory Design. HWID 2012, IFIP AICT 407, pp. 65–72, 2013. Druzhinina, O., Hvannberg, E. (2012) Feedback in a Training Simulator for Crisis Management Compared to Feedback in a Real-Life Exercise. HWID 2012, IFIP AICT 407, pp. 124–138, 2013. Ericksson, E., Swartling, A., (2012) UCD Guerrilla Tactics: A Strategy for Implementation of UCD in Sweden’s Military Defense Organizations. HWID 2012, IFIP AICT 407, pp. 112–123, 2013. Madsen, S., Nielsen, L., (2009) Exploring Persona-Scenarios – Using Storytelling to Create Design Ideas. HWID 2009, IFIP AICT 316, pp. 57–66, 2010. Nielsen, L. (2009) Personas in Cross-Cultural Projects. HWID 2009, IFIP AICT 316, pp. 76–82, 2010. Pedersen, R., Clemmensen, T. (2012) A Design Science Approach to Interactive Greenhouse Climate Control Using Lego Mindstorms for Sensor-Intensive Prototype. HWID 2012, IFIP AICT 407, pp. 73–89, 2013. Amaldi, P., Smoker, A., (2012) An Organizational Study into the Concept of Automation in a Safety Critical Social-technical System. Working Conference HWID, Copenhagen, Denmark. HWID 2012, IFIP AICT 407, pp. 183–197, 2013. Duvaa, U., Ørngreen, R., Mathiasen, A., Blomhoj, U., (2012) Mobile Probing and Probes. HWID 2012, IFIP AICT 407, pp. 161–174, 2013. Franssila, H., Okkonen, J. (2012) Adjusting the Design Target of Life-Cycle Aware HCI in Knowledge Work: Focus on Computing Practices. HWID 2012, IFIP AICT 407, pp. 150–160, 2013. Fuchsberger, V., Murer, M., Meneweger, T., Tscheligi, M., (2014) Capturing the In-Between of Interactive Artifacts and Users: A Materiality-Centered Approach. Workshop HWID, NordiCHI, Helsinki, Finland. Garg, A., Govil, K. (2102) Empirical Evaluation of Complex System Interfaces for Power Plant Control Room Using Human Work Interaction Design Framework. HWID 2012, IFIP AICT 407, pp. 90–97, 2013. Proença, R., Guerra, A. (2012) Natural Interactions: An Application for Gestural Hands Recognition. HWID 2012, IFIP AICT 407, pp. 98–111, 2013. Velhinho, L., Lopes, A., (2012) A Framework in Support of Multimodal User Interface. HWID 2012, IFIP AICT 407, pp. 175–182, 2013.